Not everyone is familiar with Coeliac disease or the gluten-free diet and even those who are familiar with it may not be as knowledgeable as you. Celiac = 'Celíacos' in Spanish. FACE is the Spanish Coeliac organisation and publish a list of safe for coeliacs products as well as other info for Spanish market. 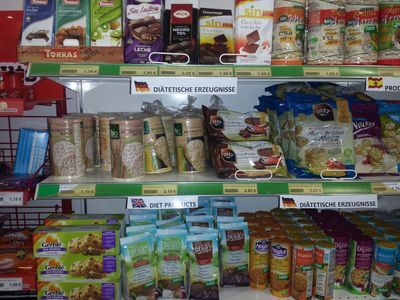 Diabetics are generally well catered for in resort supermarkets - look for 'Sin Azucar' on the packaging. 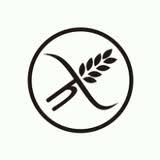 Variations of the 'no wheat' logo will indicate gluten free or 'Sin Gluten'. Lactrose free, Soya and Almond milk is available though you might have to hunt around in smaller Menorcan beach resorts. Larger supermarkets stock products below. 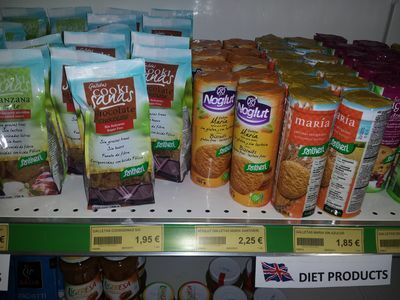 Most menorcan beach resorts are seasonal/non residential so the supermarkets carry a small line of products. 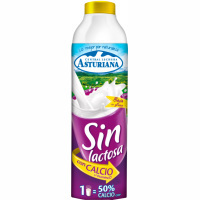 Asturiana is a major brand in many supermarkets who offer Soya and Almond based milk ( major Supermarkets with such products on menorcaEroski, Mercadona in Ciutadella/Mahon ) Gullon produce several gluten free product ranges. 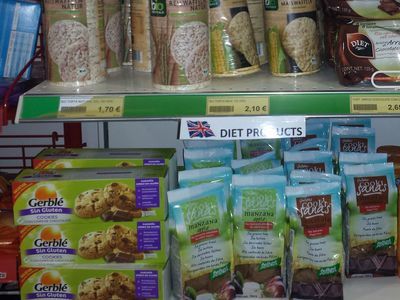 If you are mobile, Menorcan towns will incresignly have a specialist health food shop ( eg in Es Castell ) offering an extensice rane for all dietry requirements. Let the waiter know that you are coeliac ( “celiaca” is Spanish ) and that you need to follow a gluten-free diet - easier said than done we know! Restaurants don't always know about coeliac disease or gluten issues so "sin pan, sin harina" is often more useful than "sin gluten" or “celiaca”. The following restaurants are known to offer a gluten free ( celiacs ) menu. Does this dish contain wheat, rye, barley, or oats? Esta comida contiene trigo, centeno, cebada o avena? Gracias por su ayuda Thank you for your help! Discuss the menu items that you think might be suitable for you. Don’t be afraid to ask about ingredients and how the dish is prepared. There are gluten-free dishes that can be found on the great majority of menus in restaurants (salads, grilled fish and meat, egg omelets, homemade desserts, fruit, etc). Just ask a few questions to make sure about the ingredients and preparation. Also ask for a clean fry pan when ordering a grilled dish. Sometimes flour is sprinkled on the normal grilling surface to keep things from sticking, and this represents a clear danger for cross contamination.